Starting Point-Teaching Entry Level Geoscience > Cooperative Learning > Why Use Cooperative Learning? Will cooperative learning help students learn? Research has shown that students who work in cooperative groups do better on tests, especially with regard to reasoning and critical thinking skills than those that do not (Johnson and Johnson, 1989 ). In Slavin, 1991 's review of 67 studies, 61% of the cooperative-learning classes achieved significantly higher test scores than the traditional classes. He notes that the difference between the more and less effective cooperative-learning classes was that the effective ones stressed group goals and individual accountability. Slavin (1996) further argues that "cooperative learning has its greatest effects on student learning when groups are recognized or rewarded based on the individual learning of their group members" (p. 52). Cooperative learning has also been observed to enhance achievement of female and African American students (Herreid, 1998 ), members of groups that are underrepresented in various disciplines. Students in mixed groups (different races, genders, learning styles) tend to have a deeper understanding of the material and remember more than those in homogeneous groups (Wenzel, 2000 ). 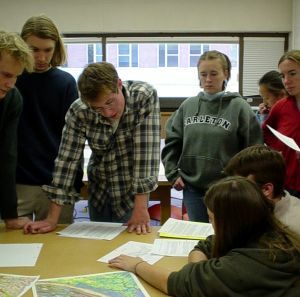 Williamson and Rowe, 2002 observed that students in cooperative-learning sections were more willing to ask the instructor questions (in class or through office visits) than those in traditionally taught sections. One reason for improved academic achievement is that students who are learning cooperatively are more active participants in the learning process (Lord, 2001 ). They care about the class and the material and they are more personally engaged. Even if student satisfaction were not an end in itself, it should be noted that motivated students are less likely to miss class or drop out. In a study on the retention rates of African American students majoring in mathematics and science at Berkley, Treisman (1985) found that the five year retention rate for students who were involved in collaborative learning groups was 65 percent, much higher than the 41 percent for students not participating in such groups. There was no significant differences in achievement between the two classes for students that finished the course. But 33% of the students in the lecture class dropped out of the course compared to only 17% of those in the cooperative-learning class. Instructors who routinely have students work in groups not only conserve materials but also provide opportunities for students to engage in more substantial projects or a larger number of smaller projects than they could achieve individually. Teamwork is essential in modern workplaces. Most projects need different kinds of experts, or at least a division of labor. All jobs require the ability to communicate, cooperate, assess, and delegate. Even outside of work, it is generally neccessary to get along with and communicate with other people. Johnson et al., 1998 stress that the most successful individuals in business, research, and school are the least competitive. Why Does Cooperative Learning Work?